Vanessa Christie | Why is my baby fussy in the evening? Is your 5 week-old baby awake at 9pm? Does your 4 month-old feed every 2-3 hours, or more? Is your 15 month-old waking in the night? Rather than your baby being a problem (or thinking that you are doing something wrong), it helps to see that these babies are behaving just as babies do – as unique human beings – displaying their own individual needs and developmental stages and capabilities. We are bombarded from all directions with unrealistic expectations of what should be happening and when, which only serves to pile on unnecessary pressure and angst. Think of some books, TV programmes, social media and companies with vested interests, just for starters. These images and ideals of how things should be, actually often fail to be grounded in any physiological or psychological understanding of how we all develop. One example of this is the worry that something must be wrong, if a young baby isn’t settling well for the evening around 7pm – a common bedtime in the UK. The hope is that your little one will get some quality shut-eye, whilst you can have some downtime. Some babies will seemingly adapt to this readily and without coercion, which is certainly nothing to worry about. However, many don’t and the ones who don’t may be termed ‘fussy’. You may be told that this problem can be dealt with by sleep-training or a different type of milk and that you are exacerbating the behaviour by ‘spoiling’ them. However, I prefer to see things from a different point of view…. 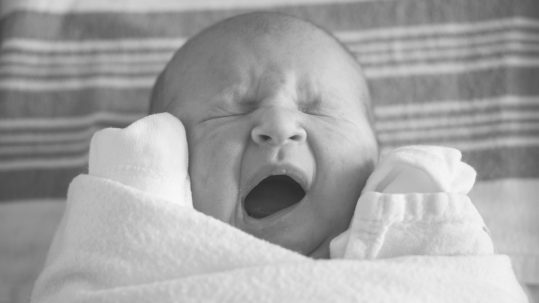 Fussiness is different from colic (see does my baby have colic?). These ‘fussy’ babies are not hurting babies. They are not crying inconsolably for hours at a time. They are simply awake for seemingly hours and not really knowing what to do with themselves. These babies are trying to adapt to their new environment and regain their sense of organisation that they had in the womb. In there life was easy. The temperature was constant, they never felt hungry and their only real stimulation was the soothing sound of your beating heart and voice, your movements and other muffled noises. …then the early weeks and months could be a happier time for all involved. This is not to say that we have to be passive and helpless observers. All babies benefit from gentle guidance that is rooted in a holistic understanding of their unique self and the family around them. Imagine how you feel when you’ve had a jam-packed, adrenaline-fuelled day. Tired but Wired. When our brains are busy over-thinking it can be harder to get to sleep and once we are, the quality of our sleep can be fitful. This happens to babies all the time. If you think your baby is readily over-stimulated and potentially missing out on some decent kipping in the daytime this can result in increased crying and fussy behaviour. Take a step back and see what could be happening. Even a relatively calm and sedate day can be seen as fairly hectic one, to the eyes and ears of a new baby who’s brains are forming billions (no exaggeration) of new connections in the early weeks and months. Are you inundated with visitors? Is their music class pretty hectic? Are you finding yourself rushing after your older children and your baby has to follow suit? For any of these situations, and there could be many others, see if anything could possibly be tweaked in the short-term. Holding your baby in a carrier or wrap can immediately help to calm them, reduce the possibility of over-stimulation and help them nap – particularly if your hands are full with looking after other children. Feed your baby when they are showing you hunger cues and if you are breastfeeding, have someone (trustworthy and knowledgeable) check that all is well. Ensuring your baby is latched on effectively and is able to transfer milk easily, can often be a remedy for fussy behaviour. Don’t panic if your baby wants to feed frequently (known as cluster feeding). This is entirely normal and to be expected. As before though, with breastfeeding; check the latch and position of your baby’s body, as sometimes babies seemingly ‘feed’ for hours BUT they are not actually drinking (swallowing). Calming and soothing techniques such as baby massage, skin-to-skin, bathing with your baby and rhythmical rocking and patting, can all have remarkable effects on behaviour, since they subtly mimic life in the womb and gently help the adaptation process. You can help develop your baby’s circadian rhythm and slowly teach them when day becomes night, by introducing a predictable evening routine. The timings aren’t the important factor when you are beginning this. It may be 6pm one evening and 8pm the next but do it when your baby is ready (ideally calm and awake). The important thing here is about conditioning your baby to associate a specific pattern of events (eg a bath, pyjamas, low lighting, feed) and ‘winding down’ time for the night. Don’t expect your baby to necessarily fall asleep at the end of it – it can take time for them to settle into the groove. If they are still up for a party, just keep things as calm as possible with lights down and quiet voices and even pop them back into the carrier, to give you some peace (or at the very least free hands) to eat supper. It’s getting boring but the old ‘Keep calm and carry on’ mantra is worth remembering – at least whilst in front of your intuitive baby, who can react to external stress and anxiety. If friends and family ask how they can help, don’t hold back! Tell them you’d love them to put on a wash, cook a meal or hold your baby, so you can have a bath for longer than 2 minutes. If you need to cry, do it and don’t apologise for it. Crying can be a great stress reliever and may help you have a more rested sleep afterwards. Interpret your baby’s behaviour as their way of communicating their needs with you and not as a form of manipulation. Forget the fear of spoiling – of all the dodgy advice out there, anyone who talks up ‘spoiling’ are the voices to ignore the most, honestly! Have a look at ‘listening to your gut’ for more on that.